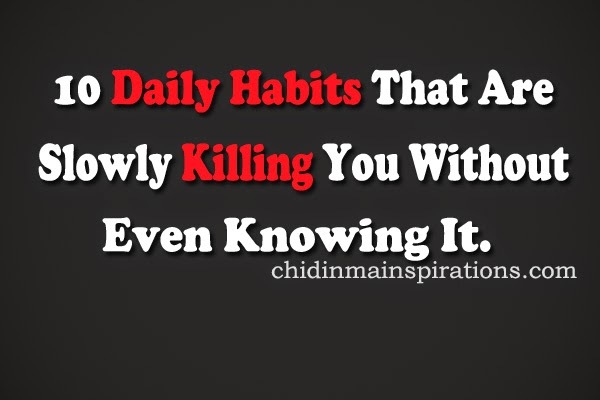 We made mention here >>>http://www.chidinmainspirations.com/2015/01/8-daily-habits-that-make-you-lose.html?spref=tw … of 8 daily habits that make you lose weight without you even knowing it and it will not be fair if we do not inspire or inform one another of some daily habits that are gradually killing us without us even knowing it. Most times we see these things are nothing out of the ordinary. Most times we do these things without the knowledge of its detriment to our lives. 1) Not flossing your teeth before brushing and after eating. Please find here >>> chidinmainspirations.blogspot.com/2014/04/the-great-wonders-of-tooth-floss.html?spref=tw … what this means in detail. 4) Holding urine. That is, not urinating when you are pressed. 5) Excessive consumption of salty foods or foods with too much salt in them. 6) Excessive consumption of fried foods. 7) Excessive intake of snacks/foods/drinks with sugary contents. 9) Regular consumption of fast foods. Very true.lets learn from this post. I am glad you were inspired by this post. Please kindly share this post with others.